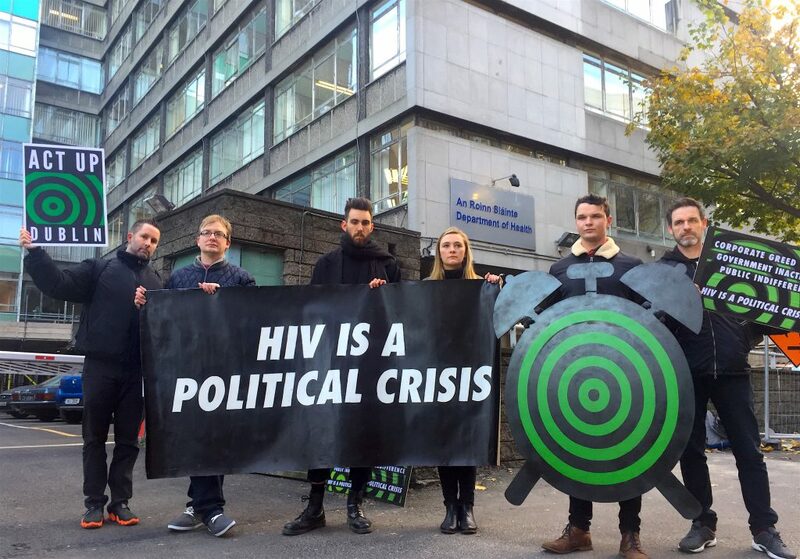 This morning members of ACT UP Dublin gathered at the offices of the Department of Health in Hawkins House with a giant alarm clock to wake the public to Ireland’s HIV crisis. We want to rouse government, community stakeholders, and the public at large into action to address the ongoing epidemic. This World AIDS Day we are changing the conversation, and drawing attention to the political dimensions of the epidemic. New HIV diagnoses are at an all-time high in Ireland and the government response is falling short. We in the community are ready for new prevention options like PrEP. Further delay on PrEP will result in avoidable new transmissions. It’s time for all of us to break the silence and demand an effective response. 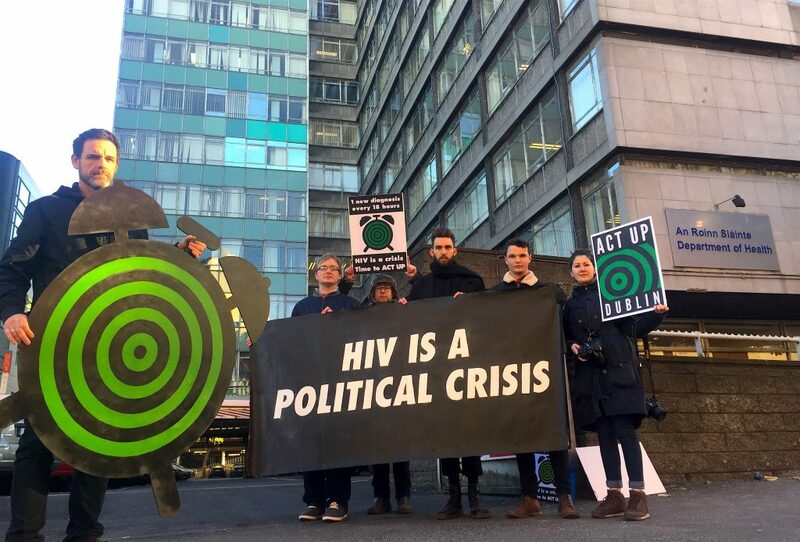 On the eve of World AIDS Day, ACT UP Dublin is sounding an alarm to government, community stakeholders, and the public: Ireland is in the midst of an HIV crisis. This morning in front of the Department of Health Offices at Hawkins House, ACT UP is installing an alarm clock to wake Ireland’s dormant institutions to the need for a renewed effort to address the expanding epidemic. Thanks to advances in treatment and prevention, government has powerful new ways to reduce new HIV transmissions. ACT UP calls on authorities to do more than offer words. Government should devote greater resources, and take effective actions, to address the epidemic. – In 2015, Ireland recorded the highest number of new HIV diagnoses ever in the history of the epidemic. Gay and bisexual men are particularly affected, now constituting over half of new diagnoses. Even accounting for those previously diagnosed elsewhere, new diagnoses in the LGBT community have been increasing for over a decade. – More people in Ireland are living with HIV than ever before. Yet government and community organisations are not doing enough to meet our ongoing needs. 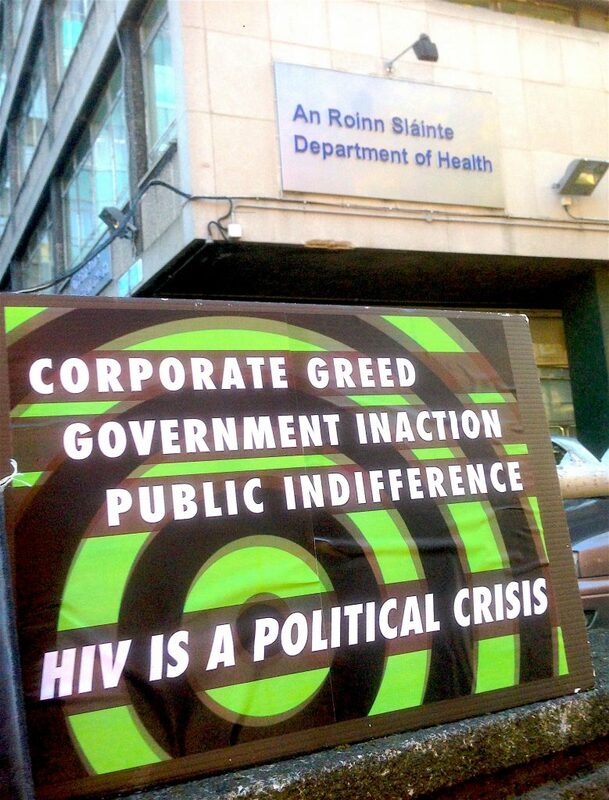 – Ireland’s public spending on HIV prevention is inadequate and lags behind peer countries. – Government delay in making Pre-Exposure Prophylaxis (PrEP) available will result in entirely avoidable HIV infections. – Government must adopt a comprehensive and coordinated HIV strategy that links clinical and community efforts to halt transmission of HIV and to care for those with the disease. – Government should permanently fund community-based HIV rapid testing (Know Now) and increase funding for our overburdened existing sexual health services. – Government should bring health surveillance efforts up to par with peer countries. ACT UP Dublin is a local chapter of ACT UP, The AIDS Coalition to Unleash Power, an international HIV activist organisation. ACT UP Dublin was founded in July 2016 to take action on Ireland’s HIV crisis. We seek a more urgent and effective response to HIV from government authorities, community organisations, and the public at large. The full text of the release also appears below. ACT UP Dublin will present a community forum about pre-exposure prophylaxis for HIV—more commonly known as PrEP—this Thursday, November 10 at 7PM. The forum is intended to spark community discussion about HIV prevention and to encourage community involvement in Ireland’s HIV crisis. More people were diagnosed with HIV in Ireland in 2015 than ever before. The event will feature short informational talks about PrEP, followed by a substantial period of questions and commentary from members of affected communities. Dr. Paddy Mallon, from the HIV Molecular Research Group (UCD), will speak on medical and scientific aspects of PrEP, including future research that will be conducted in Ireland. The discussion will be moderated by Dónal Mullligan, lecturer in the School of Communications at DCU. PrEP is a safe and highly effective way for people who are HIV-negative to prevent HIV by taking a single daily pill. The pill, with the brand name Truvada, has been approved for use in HIV prevention in eight countries around the world. It received marketing authorisation from the European Medicines Agency in August. When used as directed, PrEP provides nearly complete protection from HIV. The World Health Organization, the US Centers for Disease Control, and UNAIDS all recommend that PrEP should be available to people at substantial risk for HIV. Irish authorities, under the aegis of the National Sexual Health Strategy (2015), are currently assessing whether, when, and how to make PrEP accessible in Ireland. ACT UP Dublin is a local chapter of ACT UP, The AIDS Coalition to Unleash Power, an international HIV activist organisation. 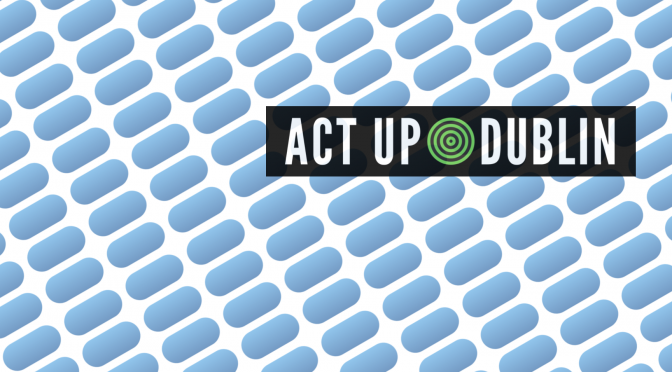 ACT UP Dublin was founded in July 2016 to take action on Ireland’s HIV crisis. We seek a more urgent and effective response to HIV from government authorities and community organisations.